Asus’ ZenWatch 2 looks good, and at $130 it might be worth it for the the few delightful tricks it can do. 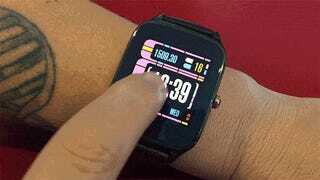 But it’s also unmistakably an entry-level smartwatch and remains hobbled by Android Wear’s basic limitations. The ZenWatch comes in two sizes, and I made the mistake of getting the larger one. There’s the big 49.9mm x 40.7mm model, and the smaller one shaves a good three or four millimeters off those dimensions. As you can see in some pics and GIFs below, people with tiny wrists like myself are not well-suited for the big one—it completely covers my arm. More like a cuff than a watch. But despite those big dimensions, the display itself is considerably smaller at only 1.63 and 1.45 inches. 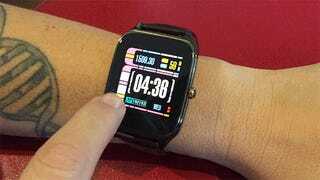 Those massive bezels kind of clashed with the futurist look of my nice LCARS watchface. Although considerably cheaper than new Android Wear-ables, the ZenWatch still has all the typical amenities you’d expect from a smartwatch: Bluetooth 4.1 and wifi, onboard sensors that detect gestures and movement, and even water resistance. It’s powered by a Qualcomm Snapdragon 400, the common silicon soul for so many Android Wear smartwatches out there. And it’s all encased in a rectangular bubble of hard Gorilla Glass, so the watch face feels solid and scratch-resistant. It can withstand the power of cat curiosity, too. The ZenWatch 2 comes in silver, gunmetal gray, and rose gold, and you can pair it with a range of bands—some of which are premium leather. I got the gunmetal gray and premium leather combo, which looks great, but this still leather we’re talking about, so it can be kind of uncomfortable, especially on teeny wrists. Because I’ve been so traumatized by constantly living in a world of microUSB-tethered gadgetry, I was happily astonished by the longevity of the ZenWatch 2’s battery. I only needed to charge it every two days, even after heavy use like texting, pulling up Google Maps, or reading an unending stream of notifications. Plus if it does die, you can top off the battery in about 40 minutes, at least according to Asus. You can still tell it’s the same LCARS display, but flick your wrist to look more closely and the display jumps into full color. Notifications will also appear on the watchface in low power mode, so remaining passively connected is also energy efficient. Android Wear basically works the same as it did at launch. You swipe up on the watch face to see your notifications. You swipe left to see apps, and tap to open. 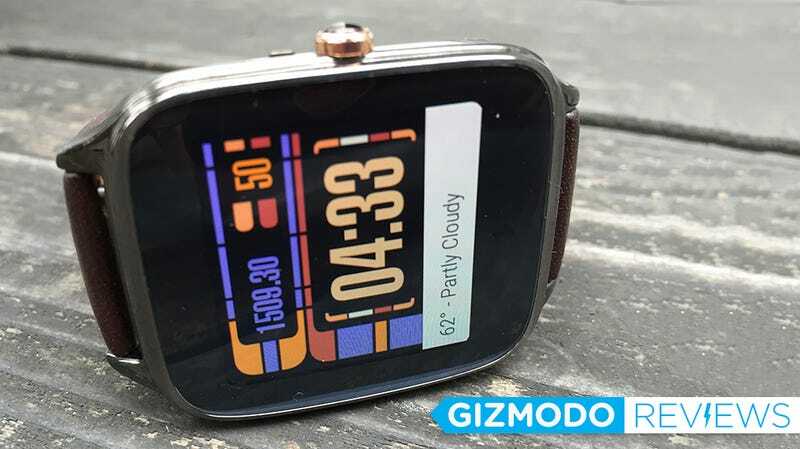 For one thing, there are definitely more apps available than last year, when I first started to dive into Android Wear—and far, far more watchfaces, which is why I am now able to show my Star Trek love. One of the biggest and best improvements is Google Maps. The app now works almost exactly like it does on other devices. You can pinpoint your location, swipe around on the map to see what’s nearby, and get directions easily. Oh, and it’s also one of the thinnest watches out there. Like Apple Watch thin, but at a fraction of the price. It’s in those moments, you sense smartwatch’s slow yet ultimately forward progress. But problems still persist. Let’s be real for a second—there are a lot of issues with Android Wear devices, and just smartwatches generally, so some of what dismayed me with the ZenWatch 2 may not surprise you. First, there’s the awkwardness. You’re wearing a touchscreen on your wrist, and it doesn’t know when you’re leaning against a railing or interacting with it deliberately. I can’t tell you how many times I would accidentally touch the screen and it would assume I wanted to switch watch faces—because the gesture to switch faces is a long press on the display. So I wound up spending a lot of time having to tap the display just to re-select my same watchface. But the whole UX is awkward, too. The idea is that you can see your upcoming appointments and notifications at a glance—and that is true, like Google Now strapped right on your wrist. And that’s when I find the watch a huge help, like when I’m carrying my phone in my backpack and it vibrates to let me know when I’m getting a call, for example. Also, I did a lot of texting from the watch, using both voice and the “draw your own emoji” feature, and it worked sort of ok. The issue? Look at me sending my special friend an emoji, above. See how many taps that took? It quickly approaches that threshold of “should I just get my phone and do this?,” and after only a week I started to feel twitchy in my fingers. Then there’s the constant, frustrating dance between your phone and smartwatches with apps like Lyft, Citymapper, or even the phone itself. You’re constantly being handed off to complete actions on your phone, so what’s the point again? Is It The Smartwatch For You? It’s not fair to levy all these complaints against the Zenwatch in particular, the problem is with the entire class of device. But if you want to experiment with bringing an Android Wear device into your life, ZenWatch 2 might be a good place to start. Should you upgrade from a previous generation? Definitely—especially given ZenWatch 2’s starting price, which makes it more affordable compared to things like the Moto 360, if your chill with those giant bezels, that is. Still, if you aren’t yet into smartwatches, I’m going to offer this cautionary note. They are still not that great. They look cool, and they are fun conversation pieces. But they aren’t really useful yet. If you are hoping for a James Bond wrist phone, wait another couple of years. They’re definitely coming. If you just want to play with a gadget for fun—and have a little cash to burn—snap up a ZenWatch 2.